Ed Hoskins has written another article on WUWT. It's a very mixed up piece. He starts out arguing we're heading for an ice age, basing his assertion on very wrong premises. I've written about his nonsense before - such as here and here. These ice age alarmists are so tedious, aren't they. If Ed Hoskins put half as much effort into learning about science as he does protesting and denying it, he could almost pass for an educated man. The temperature record of the Holocene can be seen in the GRIP Greenland ice core data. However since the year 2000 a change has occurred: the CET record shows a marked reduction from its high levels loosing all the gains that it has made since 1850, even though at the same time CO2 levels have escalated further to ~400ppmv. Central England had a cold year when the world as a whole had the hottest year on record - in 2010. The following year, 2011, was among the hottest, but Ed stops his chart before that year. He stops at 2010 and doesn't include the last two years. And it was only four years earlier than his favourite coolish Central England but hottest year on record for the rest of the world, in 2006, that Central England had its hottest year on record. Just looking at the general trend, like the eleven year moving average, I think it's fair to say that Central England no longer has the climate of the mid-nineteenth century. And the temperatures in Central England also fluctuate a lot more than those of the earth as a whole. So much for Central England cooling down. In any case, since when was Central England the whole world? 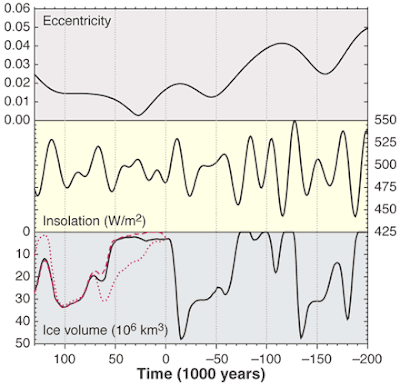 On past experience, our current benign interglacial period should or could be drawing to its close. What past experience he doesn't say. The only hint as to what is in his mind is his reference to the Eemian, which he claims lasted only 10,000 years. That's not so if Wikipedia is anything to go by. The Eemian "began about 130,000 years ago and ended about 114,000 years ago." By my arithmetic that means it lasted 16,000 years. A big difference when Ed's argument is based on the fact that the Holocene began about 10,000 years ago. Even if you only went by arithmetic rather than science, we'd have another five or six thousand years to go. Long-term variations of eccentricity (top), June insolation at 65°N (middle), and simulated Northern Hemisphere ice volume (increasing downward) (bottom) for 200,000 years before the present to 130,000 from now. Time is negative in the past and positive in the future. For the future, three CO2 scenarios were used: last glacial-interglacial values (solid line), a human-induced concentration of 750 ppmv (dashed line), and a constant concentration of 210 ppmv (dotted line). Simulation results from (13, 15); eccentricity and insolation from (19). The only way they work out that earth could start cooling sooner would be if CO2 dropped below around 220 ppm, which can't happen for thousands of years. In addition the Global Warming advocates assume that all increases to CO2 concentration are due solely to man-made additions. This is not necessarily the case, as the biosphere and slightly warmer oceans will outgas CO2 and the Man-made contribution is only a minor part of that CO2 transport within the biosphere, possibly as small as 3% of the total. No, Ed. The oceans are still absorbing CO2 not outgassing it. Partial pressure is outweighing the temperature effect by a long way still. In fact, if roughly half of our emissions weren't being swallowed up in the oceans, we'd have already almost doubled atmospheric CO2. As it is, (400-280)/280 = 43%. Then, as if he suddenly decides that CO2 emissions are important after all, Ed starts into some weird if well documented journey into carbon emissions by country, pessimistically saying it's all too hard. I say it's well documented but must point out that most of these "documents" are from highly suspect sources like denialist websites. I'm not going to go into all Ed's arguments or 'evidence' on that score. What I do suggest is that if you do read what Ed writes, make sure you also read this new report from the International Energy Agency: World Energy Outlook Special Report 2013: Redrawing the Energy Climate Map. The IEA seems to think we can still manage to get through this if we put our collective minds to it. It writes of a New Policies Scenario and a 450 Scenario. I'm still working through the report so I won't try to say any more for risk of misrepresenting it. Assume anything and everything you read on WUWT is wrong or worse unless you can verify it in triplicate from reputable sources. Don't lose hope that the world can shift to clean energy and survive global warming, (albeit probably still with the mass extinction event sooner rather than later). I note that Ed repeats the CO2 is plant food therefore beneficial meme. There is surely more to it than that. Most modern plants probably evolved at a time of lower CO2 levels and there are all sorts of co-evolutionary matters that need to be taken into consideration (eg if the pollinators cannot adapt to a warming world it won't matter how much the CO2 promotes plant growth for example). Oh yes, that was one thing I was going to check on with my plant ecology mates who hang out on Tim's blog. Like you, I'd have thought that most of today's plants have evolved to suit today's climate and atmosphere (and soil conditions). And I'd say all agricultural species have been developed for yesterday's climate (wheat, corn, barley, horticulture etc). It's only now that plant breeders (and animal breeders) are working out how to select for the new climate, whether its drought resistance or ability to survive water-logging or maintain protein content despite growth spurts or resistance to mildew and rust etc (and for lower methane production re the animals). As you say, it all gets very complicated for the food web if some plants flower at the wrong time for the pollinators. well, the good news is even at 750 PPM CO2, the ice volume takes thousands of years to reach the level realized in the prior interglacial. The bad news if you are worried about CO2 is China total emissions have passed the USA and are going up rapidly.